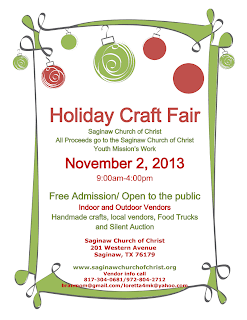 "Holiday Craft Fair by the Saginaw Church of Christ. All Proceeds go to the Saginaw Church of Christ Youth Mission’s Work. Free Admission/ Open to the public. Indoor and Outdoor Vendors. Handmade crafts and local vendors." "The Craft Guild of Dallas will present its Fall 2013 Show and Sale. This event will showcase unique, one of a kind, handcrafted works of art made by members of the Craft Guild. You will have the opportunity to browse and purchase pieces from local artists and craftsmen in Drawing & Painting, Clay, Glass, Metalsmithing and Jewelry, Book & Paper Arts, Photography, among others. Watch various live demonstrations and artists working in their medium. The public is invited to attend the free opening night reception Friday evening, November 1st, from 6:00 p.m. to 10:00 p.m. featuring live music, refreshments, and a silent auction benefiting the Craft Guild of Dallas." "Tri-County Fall Festival: 3 day community event - Merchant vendors, Kids' Korner - Face painting, sand art, hair coloring, bounce houses. Food court, outdoor primitive camping, biker rally. INDOOR WEEKEND CAMP MEETING Fri at 7 pm - Headless Worship with Chris Brackett and music by Josh Knight. Sat. 7 pm - The Delivered Chapter Lou Kelley & Johnny Moffitt Sunday Morning 10 am Circuit Rider Biker Rally." "This Craft Fair is a major annual fundraiser for FirstChurch Plano's missions. There are 95 vendor booths inside with a few outdoor spaces that are showcasing their handmade, unique items along with an array of your favorite direct sales companies. This event has free admission and parking. Concessions available. It is expected to attract approximately two thousand shoppers eager to find early Christmas shopping bargains." "I wanted to personally invite you to the 27th Annual Ryan High Arts & Crafts Show being held this Saturday, November 2nd, 2013 at the Ryan High School campus from 9:30 am to 4:00 pm. We are featuring over 100 crafters and expect it to be one of our best shows ever. All proceeds from the show will support PTSA and the Renaissance program, which encourages academic achievement for all of our students. I hope you will support PTSA by attending the show. Also, you can help us get the word out by forwarding this email to any of your friends who might be interested in coming to the show." Admission is $1.00 per adult, children are free. "The Plano West Snowflake Bazaar is a holiday gift sale featuring over 140 booth spaces and over 100 quality vendors. Thousands of people attend and shop at the bazaar. It is a great place to purchase personal and unique gifts for yourself and others. " "Come and enjoy a fun filled night at Valley Ridge Elementary! Petting Zoo, Rides, Games, and more. Over 1000 families expected to attend. Still accepting Vendor Applications! Email Kelly at Carnival@valleyridgepta.org for questions or to make reservation." (just North of FM 407 on Garden Ridge Blvd). Admission is free. Wrist bands and tickets will be sold at door for rides, games, food and attractions.